Leslie Uggams. Photo: Gerry Goodstein. History is being made over at the Harriet S. Jorgensen Theatre on the UConn campus as Leslie Uggams becomes the first African-American actress to star as Rose in an Equity production with a mixed race cast for the musical Gypsy. Uggams, a Tony and Emmy Award-winning star of the stage and screen for six decades , who perhaps is best known for her role as Kizzy in the TV mini-series “Roots,” is no stranger to playing great roles not typically associated with an African-American actress. She’s played Maria Callas, Reno Sweeney, Desiree Armfeldt and Dolly Levi. So did director Vincent J. Cardinal set out to make history by casting her as Rose? Apparently not, according to publicity from the theater. “This is a multi-racial production. We are a university community, and we cast our plays to represent the global community that we serve. Our cast includes Latino, African American, Pacific Islander and Caucasian actors. It is not about the historical accuracy of race in America at that time,” he explained. Uggams also is a bit older than the typical Rose. She apparently had been considered for the national tour of the Broadway revival of the show that starred Bernadette Peters back in 2003. I give you all that information, rather than delving right into a review of the production, because it’s an important moment in theater history. And it’s happening right here in Connecticut. (You can see the show through July 20 as it closes out the Nutmeg Summer Series for CT Repertory Theatre. Uggams is a ball of energy and throws herself into the part, though she has a few struggles vocally (remember, this is a part some of Broadway’s biggest belting voices including Ethel Merman, Patti Lupone and Bernadette Peters once sang….). She conveys well the manipulative stage mother Mama Rose, who forces her daughters – and anyone else who comes into their paths – to perform some really awful shows in vaudeville. She claims she is doing it so her daughters can be stars, but she really is trying to realize her own dreams through them. June (Alanna Suanders) has some talent and is the star. Not-as-pretty, and not-as-talented -- at least that is what Rose has her thinking -- Louise (Amandine Altomare) is always cast as a boy or in a cow costume in a ridiculaous farm act (there are a number of stuffed animal/puppet pets that make appearances). Rose hooks up with agent/lover Herbie (Scott Ripley) and the act tours across the country. Initial success wanes, however, as the kids grow up and the act loses its appeal as vaudeville dies. When June leaves to follow her heart with fellow performer Tulsa (Luke Hamilton) and the rest of the boys seek paying jobs elsewhere, Rose turns her attentions to making Louise a star. At the bottom of the barrel, they find themselves booked in a burlesque theater where a sudden opportunity transforms Louise into one of the most famous strippers of all time: Gypsy Rose Lee. While most of the attention here has been on Uggams and the historic significance of the role she is playing, one performance might get overlooked, and that would be a shame, because it’s a showstopper. Altomare is really good as Louise. She gives a nuanced, layered performance and brings to the stage a superb singing voice. Her solo “Little Lamb” was what haunted me long after – not the more famous numbers of “Let Me Entertain You,” Some People,” Together, Wherever We Go” or “Everything’s Coming Up Roses” from the songwriting team of Jule Styne and Stephen Sondheim. Kudos. Some things I’d like to see tweaked: the book – it has some gaping holes – and the sound. There were pops and static all through the performance and at times volumes obscured lyrics. But don’t let those things stop you from being a part of theater history. 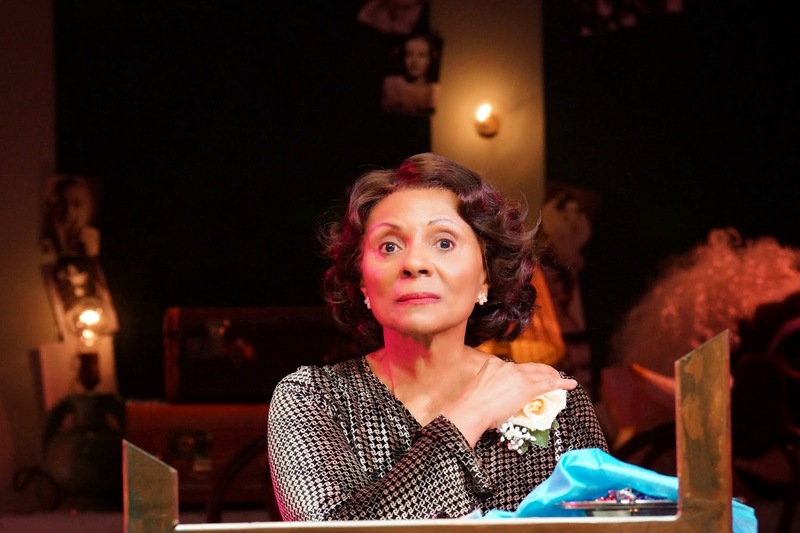 Gypsy’s songs are a treat and Uggams as Rose is the icing on the cake. 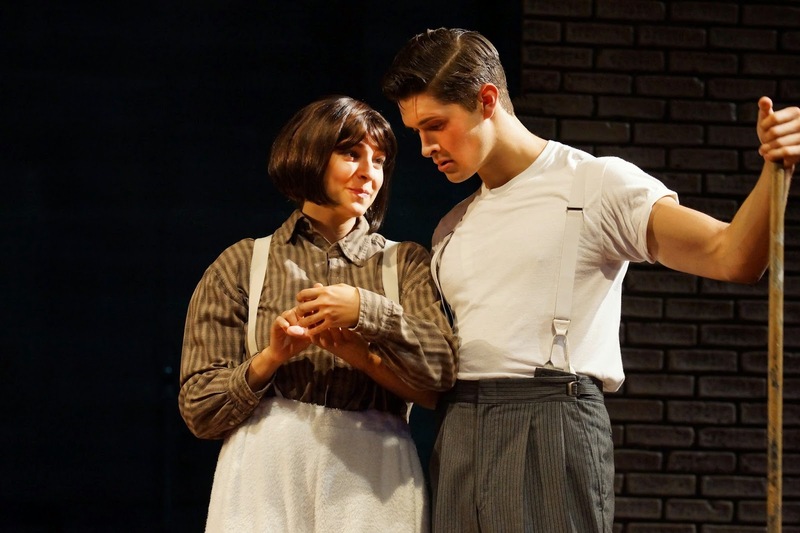 Gypsy plays through July 20 at the Harriet S. Jorgensen Theatre. Evening performances 7:30 Tuesdays, Wednesdays and Thursdays; 8 pm Fridays and Saturdays. Matinee performances 2 pm Saturdays and Sundays. Tickets: $10 to $43. (860) 486-2113; www.crt.uconn.edu. Amandina Altomare (Louise) and Luke Hamilton (Tulsa) Photo Gerry Goodstein.